What Makes A Change Lab Successful? Over the ages we’ve invested huge amounts of effort and energy to keep cities and nature separate. What would it mean if that were about to change? we learn to cherish the vitality of all life-forms equally – not just our own. Berry’s ideas could be dismissed as charming, but implausible – were it not for many small signs that just such a cultural shift may be brewing underneath the shiny surface of business as usual. Over the ages we’ve invested huge amounts of effort and energy to keep cities and nature separate. The intensity of that effort was obscured until, in 1971, a geologist called Earl Cook developed a technique to measure the energy ‘captured from the environment’ in a modern city. A hunter-gatherer 10,000 years earlier, Cook reckoned, got by on 5,000 kilocalories a day. A New Yorker or Londoner today, by contrast, needs about 300,000 kilocalories a day once all the systems, networks and gadgets of modern life are factored in. That’s a difference in energy needed for survival, between lives that were part of nature, and lives lived apart, of 60 times – and rising. Paving over the soil, and filling our lives with media, obscured our interdependency with living systems for a centuries. Now, as awareness of energy precarity grows, so do nagging questions about the ways we think about, and inhabit, our cities: How much energy does that skyscraper use each day? what level of resources are embedded in that flyover? What was it like here, before we paved it over? In 2009, the Mannahatta exhibit began to answer that last question. It exposed New Yorkers to Manhattan’s ecosystem in 1609 – just before the first settlers arrived. Today’s city of asphalt and skyscrapers, it turned out, was once a diverse and life-filled landscape. Times Square was once a forest. Harlem was a meadow. A landscape of forests, fields, freshwater wetlands, salt marshes, springs, ponds and streams was home to bears, wolves, songbirds, and salamanders. Clear waters jumped with fish. Porpoises and whales were at home in the harbor. Mannahatta’s curator, the landscape ecologist Dr. Eric Sanderson, was not intent on returning New York to its primeval condition – but he did hope that the show would sensitise New Yorkers to the living systems that continue to support their city. And a question was posed: Could these hidden ecological functions be relevant to the city’s future development? 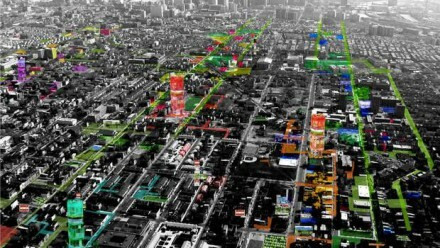 A growing worldwide movement is looking at cities through the lens of living systems. In countless practical projects, city dwellers are re-connecting with the soils, trees, animals, landscapes, energy systems, water, and energy sources on which all life depends. For the moment, this movement is mostly bottom-up, small-scale, and low-budget. It’s a barely visible mosaic in which rivers are restored by volunteers, car parks are depaved by activists, trees are planted by community teams, rainwater is harvested by neighbours, gadens are tended by school students, and nesting boxes for birds are installed by twitchers. A lot of this work is carried out by community groups working street-by-street. As more small projects are completed,the to-do list expands. People notice that there are neglected parks to transform, gardens to revive, roadside verges to plant, empty roofs to green. There are vacant lots, abandoned buildings and empty malls to put to new use. The fact that most of these actions are small does not diminish their significance. Change bubbling up from the bottom is how complex systems change – and cities are no exception. Besides, this proliferation of green shoots creates new work for for city managers and policy makers to do: Nurturing these thousands of tiny patches, removing obstacles, linking them together. A growing number of people are inclined to welcome back the weeds in the cause of biodiversity. It turns out that there is more biodiversity in many cities than outside them. The lesson here is that cities, and not just rain forests, can provide ecosystem services when they are filled with plants and trees. When researchers in the UK visited parks, golf courses, abandoned warehouses and household gardens around the city of Leicester, they discovered that urban vegetation stores ten times more carbon dioxide than previously assumed. Private gardens, too, have enormous potential to act as archipelago-like nature reserves for pollinating insects, whose populations have been plummeting across the U.S. and Europe. The UK’s 15 million backyard gardens cover about 270,000 hectares – more than the all the country’s official nature reserves combined. Seattle’s Pollinator Pathway Program links together urbanism, farming and wilderness recovery in a connected whole. The artist and ecological designer Sarah Bergmann coordinates with citizens, urban planners, engineers, and parks departments to replant and connect small areas of public and privately owned urban land; the resulting corridors mimic the healthy systems commonly found in rural and wild environments. Each planting strip – usually a band of grass between sidewalk and street – is transformed into a pollinator-friendly garden that offers viable food and habitat to vitally important insects. Fifteen Pollinator Pathway gardens are now in place on Columbia.While motivated in part by concern for honeybee colonies, the project takes a long term perspective on support for regional food systems and emphasises support for a variety of native pollinator species and their favourite plants. Many of these plants turn out to be edible. Herbal fruits, leaves and edible flowers grow on walls and roadsides, between paving stones, and in other untended spaces. Urban biologist Claudia Biemans, an edible plants researcher in The Hague, identified about 300 different species in one square km of her city compared to 50 different species found in the same area of industrially-farmed countryside nearby. “Bees know this very well, and are more to be found in cities these days” she points out. On walks called ‘Stalking The Wild’, Biemans guides people to ecological niches in the city where plants don’t just survive, but thrive. Lynn Shore in Amsterdam, trading as Urban Herbology, is among a growing band of urban foragers who help citizens find herbs, use them in cooking, and learn about medicinal preparations. Shore’s activities include seed and plant swaps, urban herb walks, and ‘gatherings for urban herbies’. In Los Angeles, a so-called ‘rock star of foraging’ called Pascal Baudar has turned foraging into a thriving business; Angelinos pay $100 a head to join his ‘Gourmet Foraging Sunset Experiences’ in which they learn about the culinary uses of weeds found in the local landscape. Baudar’‘s wild food classes sell out weeks ahead. Less prosperous foragers – the majority – are using a free mobile phone app called Boskoi to map the edible landscape; they share the location of wild-food in public spaces in an activity called ‘augmented foraging’.Boskoi, say its Dutch developers, combines the ancient knowledge of hunter-gatherers with today’s mobile technology. The word Boskoi, which is taken from Greek, dates back to the tradition of desert hermits the South Egyptian and Sudanese desert. This hardy band survived exclusively on wild herbs and rainwater, and were said to graze with wild herds of cattle. Scientific researchers, following in the steps of these ecological artists, are unearthing plants and animals that are unique to cities – from mice and fish, to bugs and bacteria. In New York, scientists have identified mutations in more than 1,000 genes in the city’s mice – far more than than are found in mice from out of town. Not all change has been positive for biodiversity, of course: Manhattan was once home to 21 native species of orchids; these are now all extinct due to the replacement of woodland by open urban spaces. Or are they? Their seeds may still be there. The notion that older ecologies lie beneath our cities, just waiting to self-resurrect, has long fascinated artists – and now scientists, too. Paleobotanists have discovered that ten square feet of urban soil can contain tens of thousands of dormant seeds. In his essay ‘City of Seeds’, the writer Daniel Mason reflects that,unlike the managed green of parks and gardens, which only grow in pockets of protected isolation, the wild plants of a city need “the cracks, the pavement split, the palace abandoned”. Beyond the managed gardens and the wild invaders of our roads. Mason concludes, is “a hidden, potential flora, an idea of a forest, not in competition with the city but existing alongside it, patiently, waiting to become manifest”. This story is available in Japanese and in Spanish. Te above text was commissioned for an exhibition in The Hague called Yes Naturally I was asked to contribute a text for the book about what nature might mean for cities, and vice versa, in the near future. John, also good in this book list is Emma Marris’, The Rambunctious Garden. Biophilic Cities will be hosting a two day inaugural conference in October. If you plan to be in the US around that time, perhaps you would like to attend/presenet. It will be held in Charlottesville, VA.